If you drive in a zigzag manner or violate traffic rules, beware! Traffic cops are soon going to get revamped hi-tech bikes to warn violators before catching up with them to issue challans. The bikes will also be used for patrolling stretches prone to lane violations. The two-wheelers will also be deployed to check stunt biking and speeding in central Delhi. Sources said that around 550 Apache and Pulsar motorcycles issued to traffic police will be modified with LED strobe lights, warning hooters and a hands-free megaphone to alert drivers violating the stop line or conversing on the phone while on the move. Each traffic circle will be allotted one bike for patrol duty at busy intersections. The riders of such bikes will have a sidearm and camera to record violations.They will also have blinkers fixed on their uniforms for being visible during foggy nights. “The plan has been approved and the process to overhaul the bikes is in the process. Patrolling on such bikes will commence within a few months,“ said special commissioner (traffic) Dependra Pathak. The helmets of the riders will be fitted with headphones and hands-free devices connected to loud-hailers to direct traffic in case of congestion, especially during events and festivals. The vehicles will also be fitted with carry boxes and high-end communication systems to direct diversions. 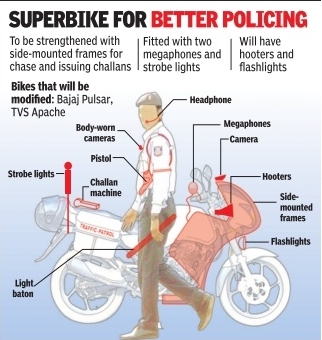 The twowheelers will also be fitted with GPS to help senior officers track their positions. Police officers said that such teams could help clear bottlenecks as it would be easier for a cop to reach the source on a bike than in a four wheeler. Delhi Police has also planned to introduce a first response system attached to the police control room in which bikes will be modified to enter small lanes.